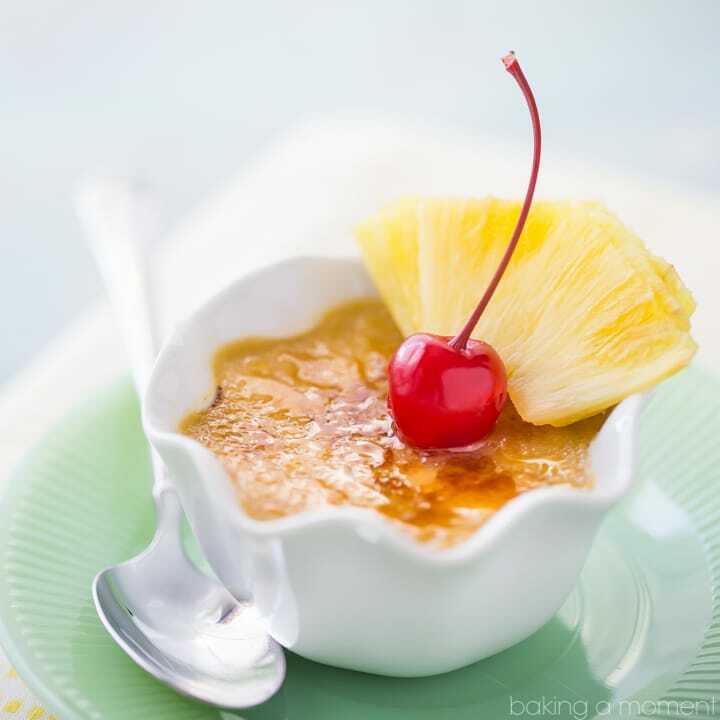 If you like pineapple upside-down cake, then you’ll love this pineapple creme brulee! 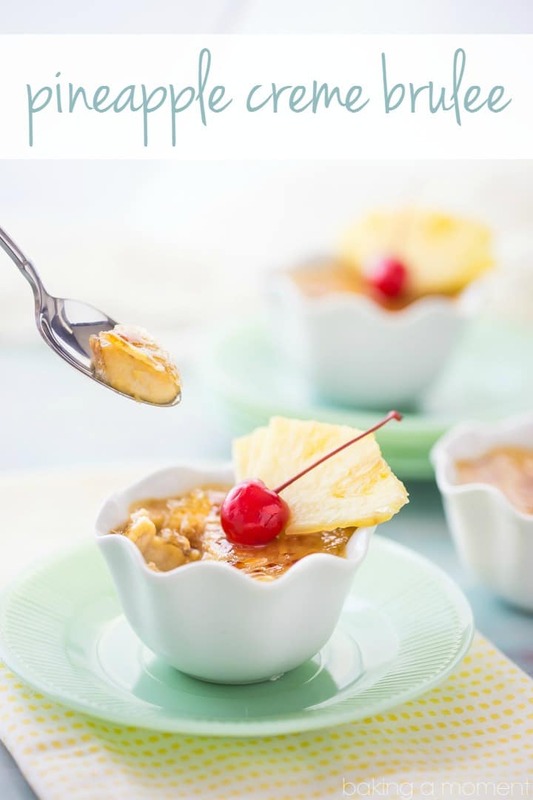 With warm brown sugar, fresh pineapple, and a caramelized sugar cap. It’s Friday, woo-hoo! My kids start their Spring break today, and I’m looking forward to enjoying Easter dinner at my mom’s house soon, with my brother-in-law, niece, and nephew. And my hubby and kids too of course! It’s been a busy few weeks leading up to this holiday, and with the kids being home all next week, I might be a little quiet here on the blog (as well as on Pinterest, Facebook, and Instagram) over the next week or so. Or maybe not! Who am I kidding, I can never tear myself away from it all! How will you be spending this holiday? 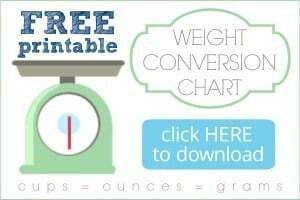 Are you hosting a brunch or dinner? Or will you be a guest at a loved one’s event? Either way, I have an Easter dessert recipe for you that’s just perfect to make or bring. It may not look like much compared to theseEaster basket cupcakes, but I can assure you, these little ramekins are bursting with THE most incredible pineapple flavor. I don’t know why but I always associate pineapple with Easter and Spring. To me, it just doesn’t feel like Easter unless there’s pineapple! And incorporating pineapple into a creme brulee custard is not as easy as you might think. I had to make this recipe several times, tweaking here and there, before I got it just right. But I really did get it right! I even made it a couple more times after that, just to be sure. You see, fresh pineapple has a lot of natural enzymes that can make it hard for things to firm up properly. So, we’re cooking it down a little in brown sugar (which also intensifies the flavor), and adding an egg white to the custard so it sets perfectly. The result is creamy, dreamy, absolute heaven! The pineapple flavor really shines through, and it’s such a wonderful compliment to that crunchy caramelized sugar topping. 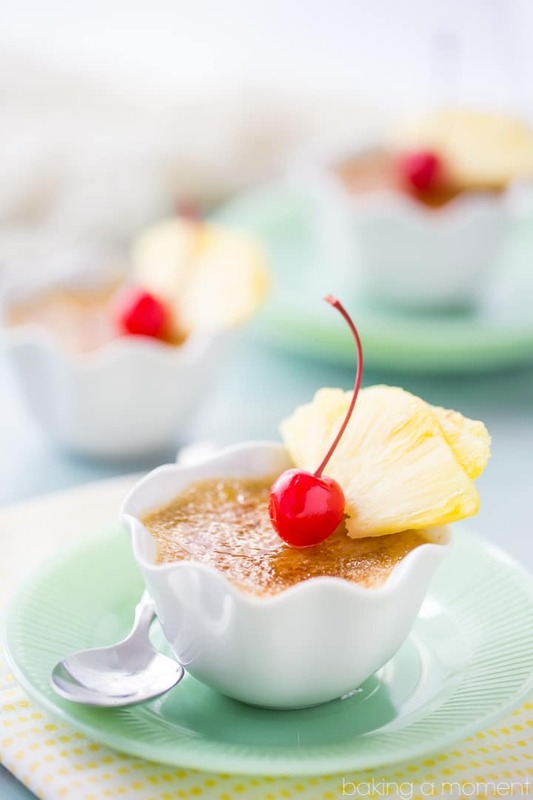 If you like all those warm, sunshine-y flavors of pineapple upside-down cake, then you’ll LOVE this creme brulee! 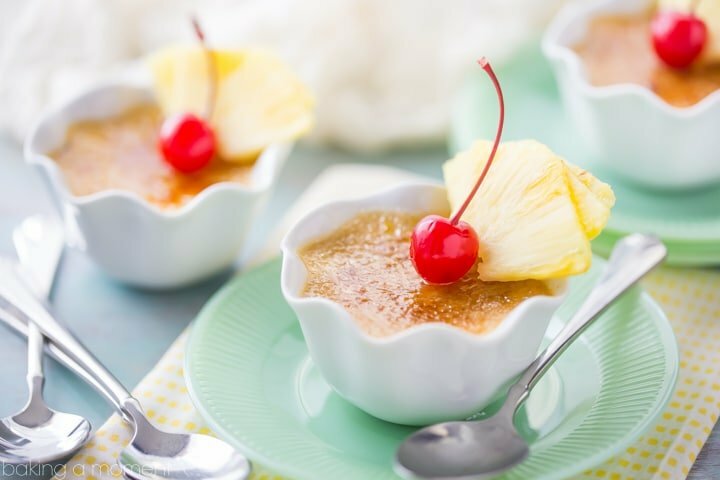 Pineapple and brown sugar are a match made in heaven, and they pair perfectly in this comforting, spoon-able dessert. I baked mine in these cute little cups I found at Pier One, but they’d work equally well in a regular ramekin or even a little mason jar. I’ve done creme brulee in a canning jar before, and it works great and makes it really easy to transport. So, that would make this a perfect dish to bring to your family get-together! Love soft, spoon-able desserts? Be sure to follow my “Ice Creams, Mousses, Custards, and Puddings” Pinterest board! Place the pineapple chunks, half the brown sugar, and the water in a small pot, and cook over medium-low heat until the pineapple is soft and most of the liquid has evaporated (about 5-10 minutes). Transfer the cooked pineapple to a small food processor or mini-chopper and process to a fine puree. Set aside. Place the cream, remaining 2 tablespoons of brown sugar, lemon zest, and salt in a small pot and heat over medium-low heat until just barely simmering. Place the eggs and lemon juice in a medium mixing bowl and whisk together until combined. Slowly drizzle the hot cream mixture into the yolks, while whisking. When all the cream has been added, stir in the vanilla and the reserved pineapple puree, and strain the mixture into a large measuring cup or spouted vessel, pressing on the solids to extract the juices. Divide the liquid equally between four 4-ounce ramekins, mason jars, or oven-safe serving dishes. Line a baking dish with a kitchen towel and place the ramekins inside. Pour very hot water into the larger dish, about halfway up the sides of the ramekins. Bake for 35-45 minutes, or until the custards are set around the edges and just slightly jiggly towards the centers. Cool completely, sprinkle the tops with granulated sugar, and brulee with a kitchen torch (or under the broiler). Garnish with pineapple slices and maraschino cherries, if desired. *Check out this easy video tutorial, for how to cut a whole fresh pineapple into bite-sized chunks. The first thing I clicked on was the Pier1 link…I have a problem lol! Love this crazy beautiful custard girl! Have a happy Easter! I have no doubt you will do amazing things with that little purchase! You deserve it. Thank you so much my dear! Thank you so much Zouhair, I’m so flattered! Isn’t that crunchy top the best?? Thank you so much Medha! Love these Allie! They sound so tropically delicious! This looks and sounds amazing!! Your baskets were adorable too!! I didn’t know that about pineapple, love learning something new! Awesome, thank you so much Malinda! Yep, pineapple can be a little tricky but luckily I was able to find a way around it 😉 Hope you’re having a great week! Oh I love this so much Allie! Such great flavors! WOW! I love these, they sound delicious. ?